This was a great weekend for live theatre in the valley. New shows began and current productions flourished. 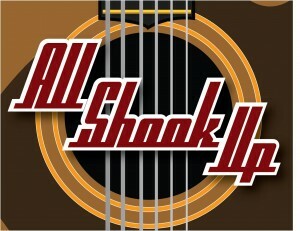 Adding to that roster was the opening of Spotlight Youth Theatre’s lively new production of the Elvis Presley jukebox musical, All Shook Up, a show that enjoyed only a short run on Broadway in 2005 but after a few revisions has continued to do well ever since in dinner theatres and even high-schools all over the country. 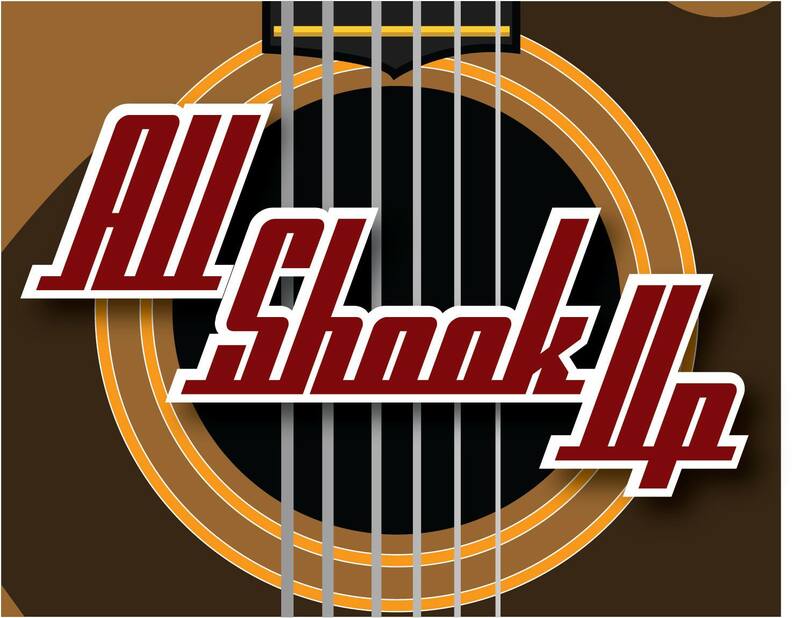 In truth, All Shook Up is not the best of the jukebox musical styled shows. It’s intentionally corny plot offers little or no surprises. The outcomes for all of the principle characters are pre-ordained the moment they first enter the stage, plus, perhaps more so than other, more successful jukebox musicals, here the already established songs aren’t in the show to service a scene, it’s the other way around. Nowhere is this more evident than in the opening of the second half where the title song is performed for no other reason other than it’s a great song and a good way of reintroducing the entire cast back on stage after an intermission. What’s important about this production, however, is what Spotlight has done with it. Having already seen the show performed some years ago by seasoned professionals, I’m more than happy to say that with the enthusiasm and non-stop energy that this young cast put into the musical on its opening weekend, despite a few rough edges, this particular production was oh, so much more fun. 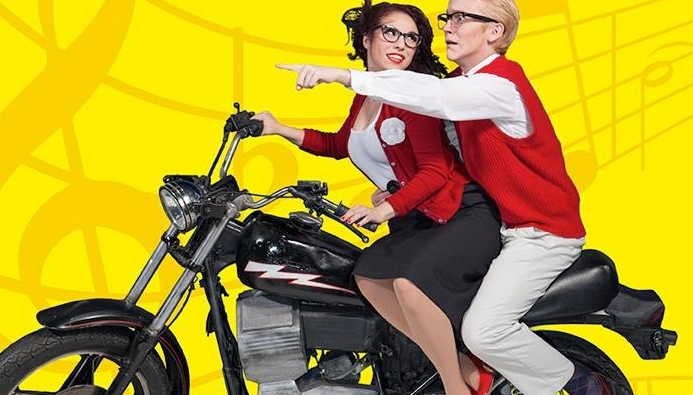 When the show was previously performed at a high school in Utah there was major concern about the show’s overt, albeit comic sexuality which had to be toned down with cuts. The story even made the major media. Fortunately for valley theatre audiences, this is not Utah and despite the average age of the teenage cast, Spotlight is no high-school set up. From what I can recall of the original show, this production is left thankfully intact. In fact, if anything, the biggest laughs from the audience came during those broad, comical moments that were probably cut from the neighboring state’s high-school effort. 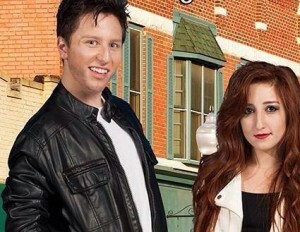 The show takes place in a small mid-western town during the fifties. Chad (Conner Morley) is a roustabout just released from jail who arrives in town on his motorbike. He needs a mechanic before leaving, which is where Natalie (Carly Grossman) comes in to play. As soon as she sees Chad bringing his hip-swiveling ways to the otherwise quiet town – a town that outlaws loud music, public necking and tight pants – she is smitten, but can’t get him to notice her, so she dresses up as a man and becomes Ed in a desperate act to get closer to him. Bobby Sample has put together an effective set design that highlights the rock ‘n roll themes of the show. Painted musical instruments flank the stage, an oversized guitar adorns the backdrop, and characters step over what looks like a large stack of platters piled high and an old-fashioned turn table, complete with an arm for its stylus. Everything appears black and white during the opening number, Jailhouse Rock – just like the movie – then becomes color once the setting effectively changes to the small town. Co-directors Mark and Lynzee 4Man – who must be two of the busiest talents in local showbiz – use the somewhat restricting area for such a large production well. They’ve assembled an ensemble which ordinarily would look dangerously cluttered in such an intimate setting, yet Lynzee’s well choreographed and challenging dance numbers – the best thing about the production – contain an unstoppable energy and sharpness of movement that makes All Shook Up burst with continual excitement. The inexperience of some of the cast shows more during dialog exchanges, but in a show such as this it’s the singing and dancing that matters, and if anything, All Shook Up is the perfect vehicle to show what Spotlight can do. 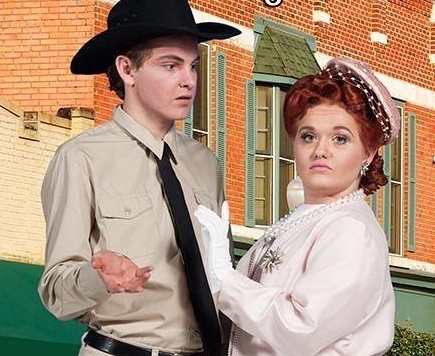 One of the most exciting things about watching local talent in organizations such as Valley Youth Theatre and Spotlight Youth Theatre is witnessing the development of talent that comes across as assured and borderline professional. All principle characters have been well cast to the point where you might forget that they’re teenagers playing adults. Both Carly Grossman and Conner Morley make perfect leads, with solid support from other principles like David Samson, Ali Whitwell, Hahnna Christianson, Riley O’Conner, Trey DeGroodt and Michael Schultz, who amusingly resembles a somewhat nerdier version of Neil Patrick Harris during his Doogie Houser days, but there’s often one whose developing talent has taken things a step further. In All Shook Up it’s Carly Makani Copp who here is given a chance to stand out, and she’s embraced the challenge extraordinarily well. Carly plays Miss Sandra, a character who becomes humorously aroused by the mere suggestion of intelligence and anyone who quotes Shakespeare. With her intentionally brazen manner, good looks, accentuated ruby red lips and thick framed, horn-rimmed glasses, she’s the dream boat librarian that bookworms fantasize over. You can’t help but find your center of focus drawn to her when she appears, but that’s the point; several of the characters from the show are drawn to her for the same reasons. With her singing and dancing abilities, plus her comic timing, Carly is an all-rounder who clearly possesses the ability to be a performer with a future beyond Spotlight. Others in the cast show some of the same early signs of potential, but it’s Carly who is already there. Remarkable for one who is only fifteen. For times, dates and tickets CLICK HERE for the Spotlight Youth Theatre website.